Easter is almost here says Jeep as they unveil seven concept vehicles offering something for everyone at the Safari. 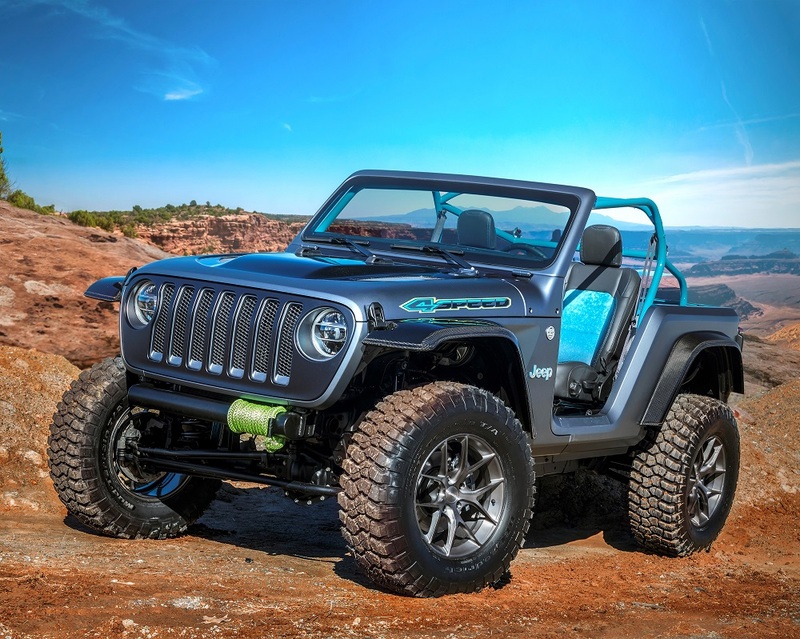 Jeep and Mopar brands have once again joined forces to create seven new, custom-built concept vehicles for the annual Easter Jeep Safari in Moab, Utah, March 24 – April 1. For the 52nd year, thousands of off-road enthusiasts will head to Moab for the annual Jeep event to participate in a week of technical off-roading on some of the most picturesque trails that the country has to offer. Light, quick and nimble, the Jeep 4SPEED concept takes cues from the popular Pork Chop concept in 2011 and Stitch concept in 2013. 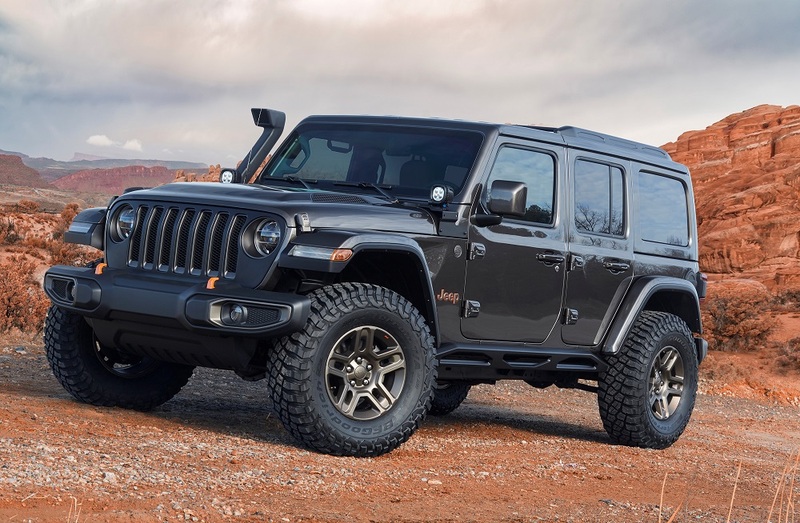 With extensive weight savings and powered by the all-new 2.0-liter turbocharged I-4 mated to an 8-speed automatic, it bolsters Wrangler’s off-road capability and performance. Other exterior elements include a shortened (22-inches) overall length that leaves the wheelbase at stock length, delivering increased approach and departure angles, Dana 44 front and rear axles with a 4.10 gear ratio and 18-inch lightweight monoblock wheels wrapped in 35-inch BF Goodrich Mud Terrain tires. Inside are a customized instrument panel, re-trimmed front seats, no rear seats, bedlned floors and perforated aluminum panel foot wells and a welding curtain as a bikini top. Inspired by Baja desert racers, the Jeep Sandstorm concept is designed with off-road hardware that will handle sandy, and other, off-road challenges with ease, says Jeep. The front axle is moved forward four inches and utilizes a heavy-duty longarm four-link suspension and track bar. The rear axle is moved back two inches and utilizes a triangulated trailing arm four-link suspension. The longer wheelbase increases high-speed stability and is supported with custom coilovers and bypass shocks that allow front wheel/rear wheel travel up to 14 and 18 inches respectively. 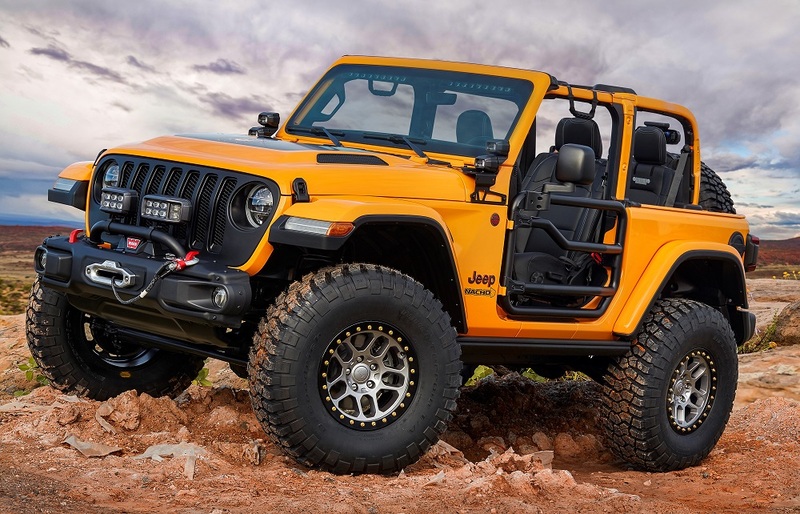 The Jeep Sandstorm is powered by a 6.4-liter V-8 engine from the Mopar performance catalog, is mated to a six-speed manual transmission and equipped with heavy-duty front and rear Dynatrac 60 axles with a 5.68 gear ratio and 17-inch beadlock wheels with 39.5-inch BF Goodrich Krawler tires – to carry the load. Interior features include a custom cage integrating the chassis, leather-trimmed front seats and unique low-back racing bucket seats in the rear with a bedlined floor. A racing-inspired cluster and 7-inch off-road GPS unit handle navigation while independent rocker switches control on-board electronics, air compressor and axle lockers. The Jeep B-Ute concept is powered by a 2.4-liter Tigershark engine and mated to a nine-speed automatic transmission. Inside, the B-Ute features custom trimmed seats with Mineral inserts, Carbonite finish on the shifter, speaker and vent surrounds, Piano Black inserts, a MOLLE system on the back of the front seats, and Mopar all-weather floor mats. 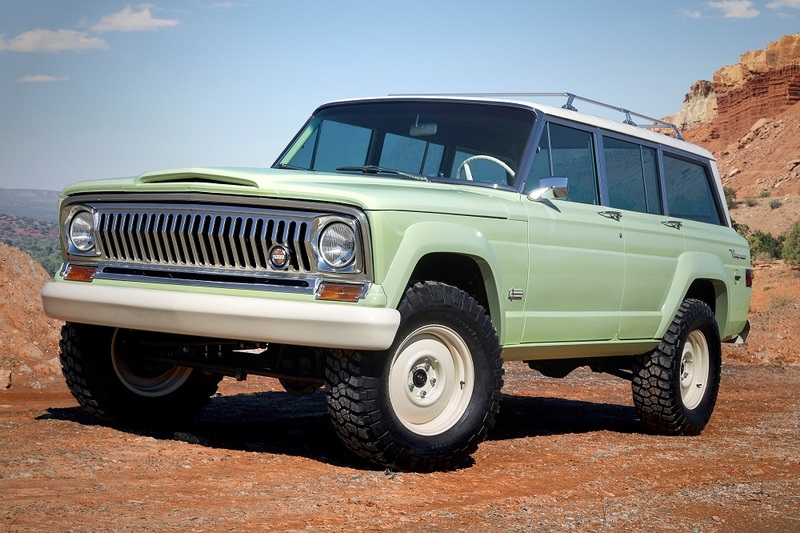 This is not the Wagoneer your family may have gone to Yellowstone National Park in ‘way back’ when you were a child – though it does retain the heritage look and utilizes its original steel body. 33-inch BF Goodrich Mud-Terrain tires. Inside, Wagoneer is nostalgic with its original front and rear bench seats, door panels, kick and rear panels, all trimmed in Oxblood-colored leather. A wicker headliner and a bedlined floor gives the Wagoneer an open, lighter feel. Other detail includes a custom cooler fashioned from period-correct luggage, and a tool box created from the valve cover of this Wagoneer’s original 230 Tornado OHC-6 engine. The Nacho Jeep serves as a rolling catalog loaded with selections from the Mopar brand’s Jeep Performance Parts (JPP) menu mixed with production parts. Cold-air intake that feeds the 2.0-liter turbocharged I-4 engine. A 2-inch lift kit increases off-road clearance and includes new 2.5-inch diameter aluminum body shocks, thicker and wider rock rails and 2-inch-round tube doors. Oversized 37-inch tires wrap around 17-inch beadlock-capable wheels, and a satin-carbon finish on the wheels is the sole conceptual touch on the Nacho concept. Beadlock trim rings are finished in high-gloss back and secured with cadmium-plated bolts. Inside, Black Katzkin leather seats are dressed up with the Jeep grille logo embroidered in light tungsten stitching on seatbacks, and light tungsten accent stitching on the seat bolsters give the interior a premium look. 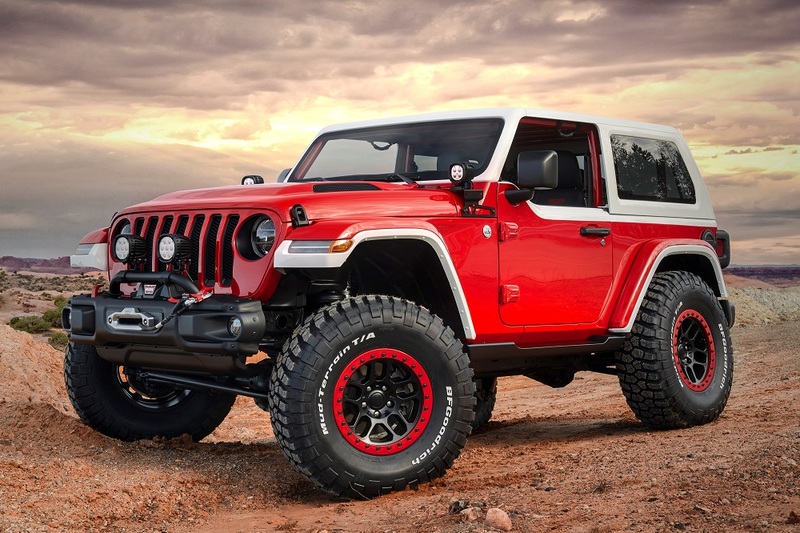 Based on a Wrangler Rubicon, this concept evokes the color palette and speedy styling of the 1966 Jeepster. The original’s classic two-tone graphic theme is mirrored on this concept with a Firecracker Red body, set off by a Bright White concept hardtop, chopped by two inches, and a Bright White custom windshield raked back 2.5 degrees to create a cropped, compact appearance. The customized windshield maintains the all-new Wrangler’s convenient fold-down feature. Bright White also accents the perimeter of the Rubicon fender flares, and an upper portion of the concept half doors. Jeep badging is replaced with a tri-color Jeepster hard badge. JPP black fuel door, grab handles and all-weather floor mats. 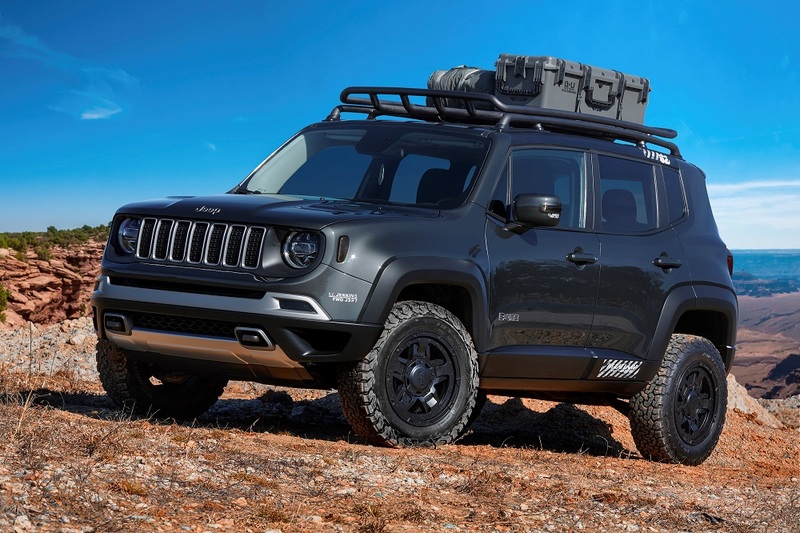 Inside the Jeepster, a concept tubular roll cage replaces the sport bar and an additional 37-inch tire is secured with a custom in-cabin spare tire carrier. Black Katzkin leather seats with Rubicon Red Jeep grille logos embroidered on the seatbacks, and Rubicon Red stitching accent the seat bolsters. The instrument panel inserts are Firecracker Red to match the exterior. With relocation of the spare tire to the cabin, concept storage packs mount to the tailgate for transport of gear and supplies such as food, water and tools. A concept rock step — a unique combination of a rock rail/side step — completes the Jeepster. Starting as a Wrangler Sahara, the J-Wagon is painted a conceptual Warm Neutral Grey with warm-tinted glass, complemented with subtle Brass Monkey touches throughout the exterior. The premium interior has Camel-color Katzkin leather seats with stark brown piping and plow-through inserts to mimic the triangulated grille design of the concept rock rails. Carrying from the exterior are Brass Monkey trim and bezel accents on the HVAC vents, door handles and steering wheel.